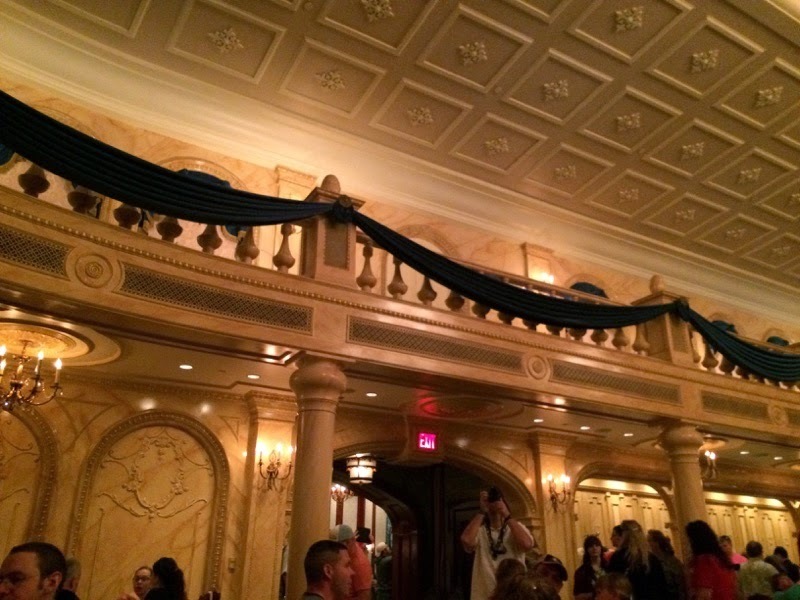 Want to eat at Be Our Guest but just can’t seem to get those coveted dinner reservations? You now have several options for a chance to eat at this very popular place! They now serve breakfast in addition to lunch and dinner. So if you just want to experience a meal in the castle, there are three great options for you. On our last trip in December 2014, we weren’t able to get a dinner reservation for dinner at BOG. We were able to, however, snag a reservation for lunch. Getting a reservation for lunch is SO much easier now than it was when we made ours. To get a reservation, which you can book for lunch at the 180 day mark*, you can call, use the app or book online just like any other ADR. And the best news? Even though you can make reservations for lunch, it is still considered a counter service (or quick service) credit for those on the dining plan. Wait. I said that was the best news, but now comes the real best news. Since switching over to the reservation system, you can also pre-order your meal 30 days in advance of your reservation date. Now, that might not appeal to some, it definitely appealed to me. You just log into your MyDisneyExperience on the site or on the app, navigate to your reservations and if you are 30 days or closer to your reservation, you can click the link under your confirmation number to select your meals. You can select them for each member on the reservation, from your meal to your drink, even to your dessert! My mouth watered just looking at the menu. Anniston didn’t know about this trip at this point, so we just selected what we thought she would eat. Remember, if you are on the dining plan, for a quick service meal, your kids can order off of the adult menu. Anniston ended up getting an adult meal because they had more options we knew she’d like. We checked in, got our cute little rose, found a table and our food magically appeared at our table. We, at that time, did not have an assigned seat. Whether that will change in the future with the new reservation system, I do not know. We sat in the ballroom and it was very enjoyable. There was a hum of noise around us, but it wasn’t too loud or overbearing. We could still hear each other and talk at a normal volume. 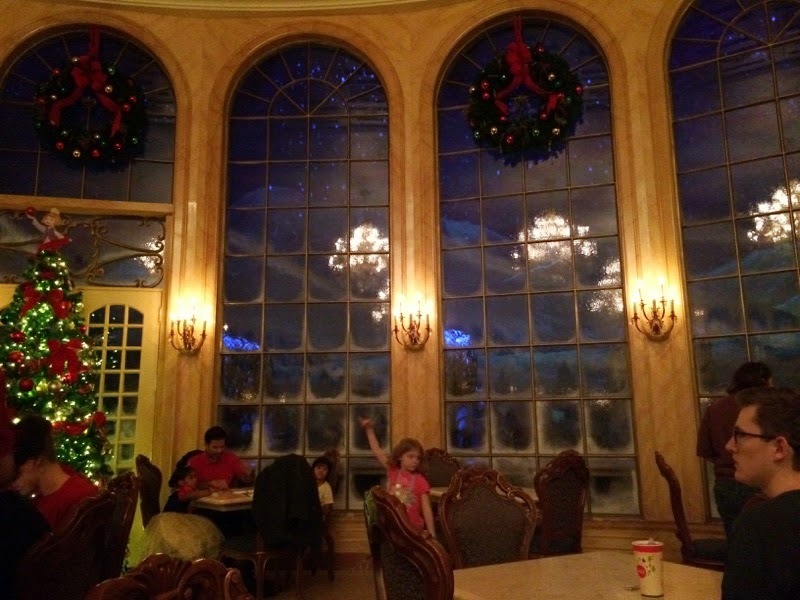 On another trip, we ate dinner at BOG and sat in the West Wing. If I had a choice, I would choose the West Wing over the ballroom just because there was so much to look at. Either room is worth it for the experience of eating at the Beast’s Castle! Our food came very quickly. We only had to wait about five minutes once we were seated. The food was hot and very, very good. To be honest, I much preferred our lunch choices over our dinner choices the previous trip. On our next trip, I can’t wait to try out the breakfast. It looks amazing! 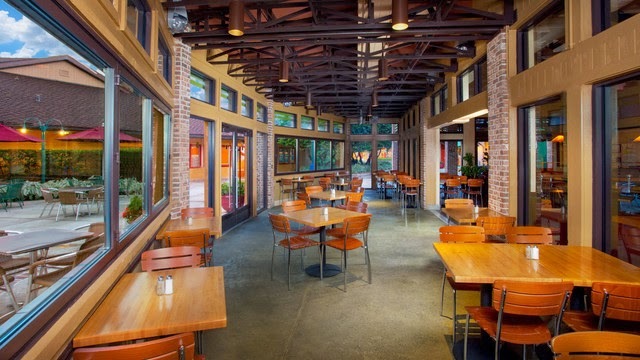 Have you been to BOG for breakfast, lunch or dinner? What was your experience like? *At the time of this post, only lunch and dinner reservations can be made 180 days out. Breakfast reservations can be made 90 days in advance. 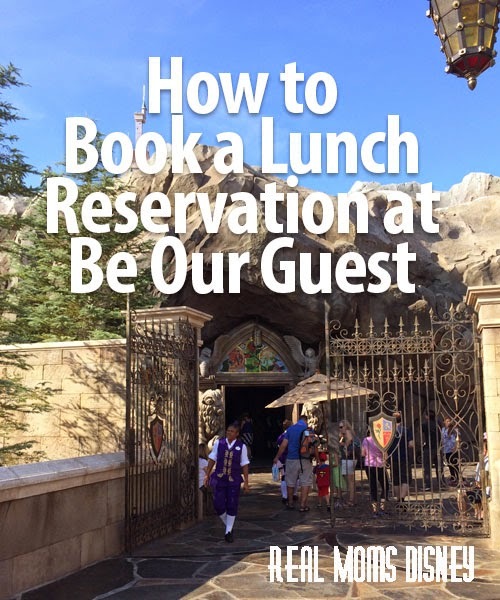 You’re going to Disney and you know you need to make Advance Dining Reservations (ADRs) for your Table Service meals. But with all the options available, how do you choose where to eat? It’s not an easy task, for sure. But are a few questions I ask myself to help narrow the choices. 1. Where do I want to eat? We’ve been to Disney before, and have friends who’ve been. We’ve read reviews on all kinds of restaurants at Disney. A few of those have stood out as places we’d want to eat if we had the chance. Start by writing those down. 2. Do I want character meals? Who do I want to see? Last time, we ate at Chef Mickey’s, and I know that’s a tradition for many families. 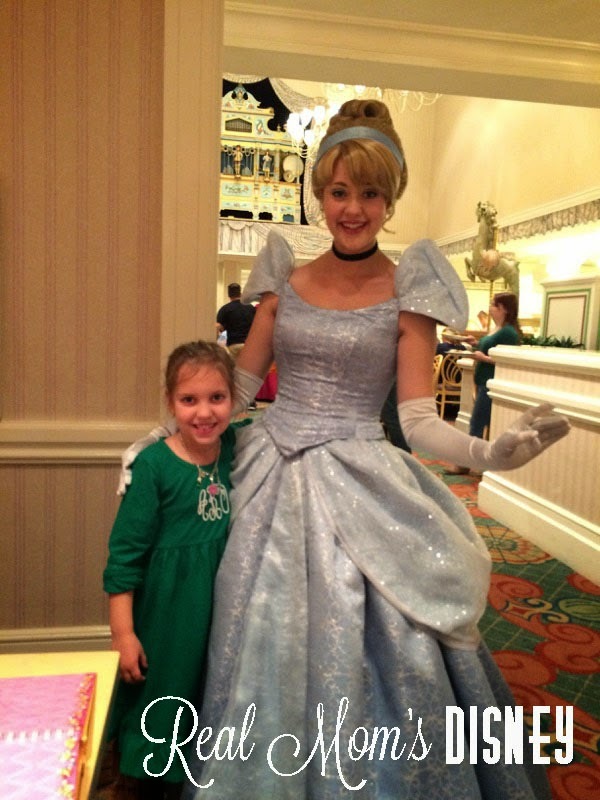 Next trip, we want to do a princess character meal, so that leaves us with a few choices like Cinderella’s Royal Table, Akershus Royal Banquet Hall, and 1900 Park Fare. Add the character meals you’d enjoy to your list. 3. Am I using a Dining Plan or am I paying out of pocket? This will make a big difference in how many Table Service meals I plan, and where they are. Table Service meal prices can vary widely. 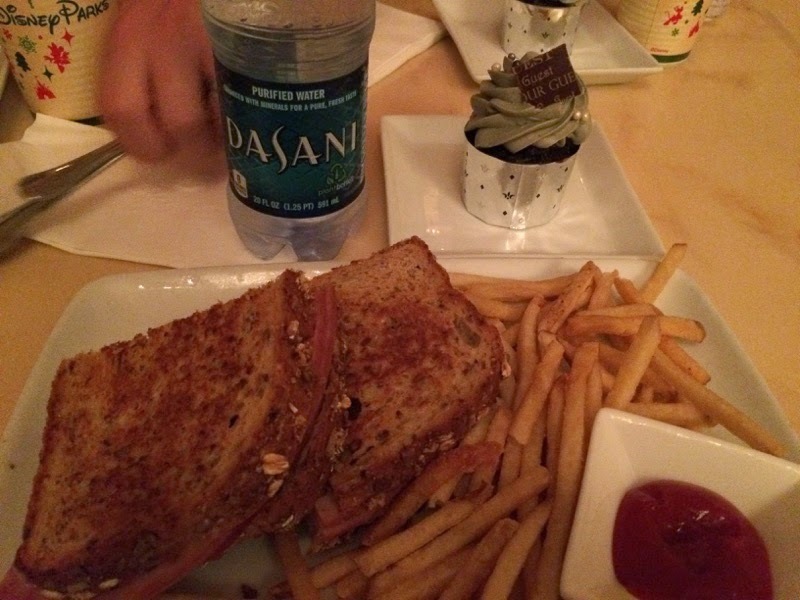 If we’re using the Disney Dining Plan, I’ll likely plan one Table Service meal per day. If we’re paying out of pocket and/or using the Quick Service Dining Plan, I will most likely plan 2 - 3 Table Service meals for the entire trip. The rest of the time, we’ll eat at Quick Service locations. Most of those do not accept reservations. 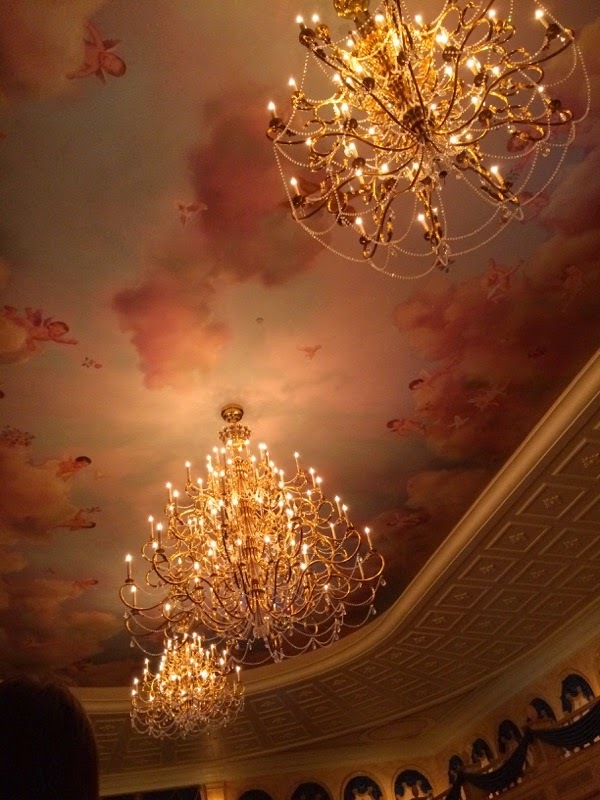 At this point, Be Our Guest is the only exception for breakfast and lunch (dinner is Table Service). There may be another option by the end of 2015 if the rumors are true, though! If you need help planning or keeping track of your dining credits, check out our free Dining Credit Planner. 4. What kind of food do I like? I love that full menus and most prices are available on the Disney website. It allows us to make sure we’ll enjoy the food and see if the prices fit in our budget at the places on our list before we decide on where to make reservations. I was considering a restaurant for our next trip that I’ve heard awesome reviews on. I checked the menu, and I don’t think my family will enjoy the type of food they serve. No matter how awesome the restaurant is, if your family doesn’t like that style of food, it’s likely not a good choice. Pick something else! 5. Where will I be at mealtime, and at what type of place will I want to eat? I take into consideration what park I will be in when it’s time to eat. If I’m planning to be in Magic Kingdom, I don’t want to plan dinner in Epcot. And that’s totally personal preference, because if you have Park Hoppers, it’s completely doable. I personally don’t want to spend the time traveling from one park to another for a dinner reservation. I’d much rather spend my time touring the park and have dinner (or lunch) wherever I am. 6. What will my kids enjoy? It’s not that I’m thinking of the kids last, but honestly, they don’t always get to pick. We’re taking their likes and dislikes into consideration when we choose restaurants, and the character meals are definitely for their benefit. But it’s not all about them. They’re going to enjoy any place we choose because they’ll be at Disney! When you’re ready to make your reservations, use our free ADR Planner to help you keep track of the details! 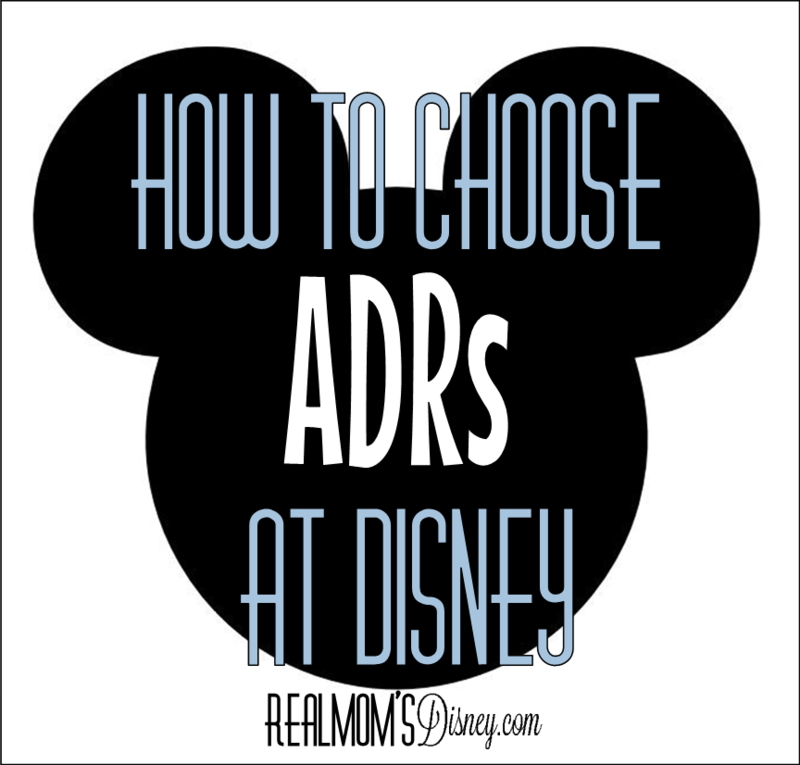 Jenna has written more about ADRs here. And as always, if you have any questions, please comment here, Tweet, Facebook, or email us. 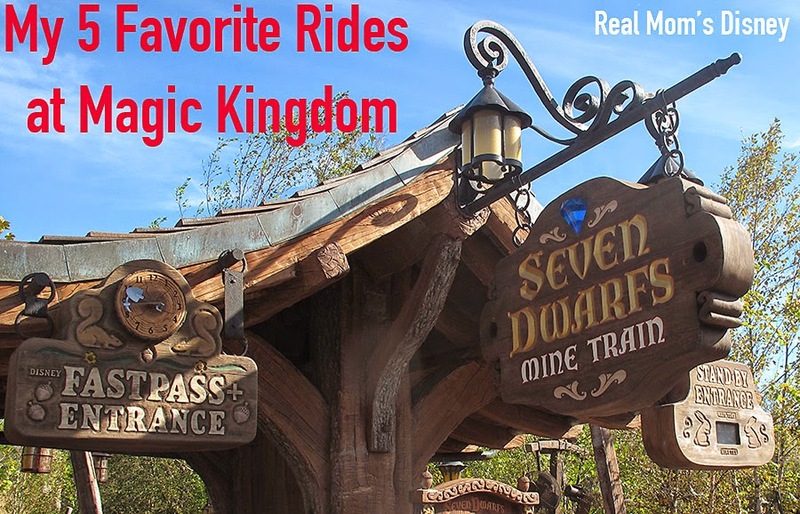 When I sit down to make my lists of things to do at each park, I include rides that we simply cannot miss. It's so easy to get wrapped up on everything that is going on around you and forget something that you really wanted to do! Note: I'm going to include some tips on fastpasses with these rides, and I plan to do another post on rides that I would recommend you get fastpasses for. The Mad Tea Party is classic Disney at its best. They haven't changed anything and they shouldn't! I grew up in California and they have this ride at Disneyland as well, so it holds a special place in my heart. Its fun and even your littlest guy or gal is sure to enjoy it! Brody was 2 when he first rode the teacups and he loved it! I wouldn't recommend a fastpass for this ride. We've been able to walk on every time we've decided to go! The Space Ranger Spin is a really fun ride for everyone. This is probably Brody's favorite ride at Magic Kingdom (and his second favorite ride from all of the parks...his favorite is Toy Story Mania at Hollywood Studios) and honestly, we all love it. It's part game and part ride! Fastpasses for this ride can be tricky. Most of the time you don't really need one, and I wouldn't use my first three (prebooked) on this ride, however, after you've burned through those, you might use one of your additional ride picks for this! This is another classic Disney ride and it tends to be pretty busy. My older son, Brayden, LOVES this ride. He considers it the first "real" roller coaster he ever rode. It's so fun and it seems to go on forever (which is a good thing). I highly recommend getting a fastpass for this one! Every time we've visited there is a long line! Until this last visit, PotC has always been my favorite ride.There is a similar version in California (I think it has two drops compared to Magic Kingdom's single drop?) and I LOVED it! On a hot day this is the perfect ride, since it's inside! I usually don't book one of my first three fastpasses for this one, but after those have been used I usually do get one for PotC. It's hit or miss with the crowds. If you're going when it's hot outside, it's likely to be busier! Magic Kingdom's newest ride is sure to be an instant classic! This ride is awesome! It quickly overtook PotC as one of my favorites. It's more of a roller coaster, like Big Thunder Mountain Railroad, but with the story of the Seven Dwarfs. Fastpasses are highly recommended! This ride is probably the busiest ride at MK! Before our first trip to Disney with the kids, I was advised to pre-purchase some Disney items to give to the kids while we were on vacation. Best. idea. ever. And let me tell you why. I am cheap. Some like to say frugal, but I will readily admit that I’m just plain old cheap. I refuse to pay stupid prices for things. (Yes, I said stupid. And prices do sometimes qualify as stupid.) But like everyone else, I want my kids to have an awesome experience at Disney, and I want them to have fun things. So, though our budget was going to be tight, I had to find a way to make it work. So, while I was planning for our trip, I wrote down some things that I wanted to purchase – autograph books, glow sticks, Disney t-shirts, etc. and I actually shopped around for things during the several months leading up to our trip. That way, I had plenty of time to find things on sale or things that I thought my kids would really enjoy, and would be fun/useful for the trip as well. Here’s how it went down: I decided what I wanted to give them each day, and added it to my daily spreadsheet/list. Then, I divided the items up by day and put each day’s surprises into labeled grocery sacks so I could keep them separate and easy to grab. I also packed a small gift bag for each kid, which we used each day for their surprises, and to carry their surprises home. Travel Day (12 hour drive): The kids were each met in the car (at 5 a.m.!) by a new stuffed friend. These were purchased from DisneyStore.com when they were running a “2 for …” special. 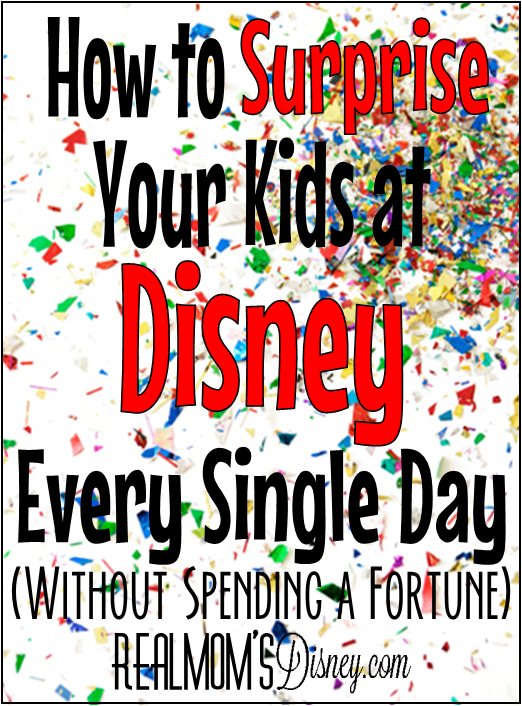 I also used an Amazon gift card for a Mickey Mouse Clubhouse DVD and Phineas and Ferb DVD for the trip, and surprised them during the car ride. I also bought a play set (like these) for each kid and surprised them with a new character now and then while we drove (I saved some for the trip home). These were also purchased during a “2 for…” special from DisneyStore.com. This was definitely our biggest surprise day (in dollars and items), but for 12 hours in the car, it was worth it. Park Day 1: This was the only day our family wore matching shirts, so their surprise was their Mickey shirt, autograph books (from DisneyStore.com) to use in the parks, and glow sticks (from the $1 Spot at Target) for the fireworks that night. Travel Day: No surprises today except for leftover characters from the play sets, but they could use their loot from previous days in the car. Spreading the shopping out allowed me to space out the purchases, and even work some things into my regular budget. I was also able to get some great deals because I had plenty of time to shop around and decide what I really wanted/needed. I spent less than $100 on everything for both kids. That included their t-shirts and autograph books! Every item (that wasn’t specifically for the park) has been used and enjoyed long after we came home from our vacation, so I feel like it was money well spent. I’ll confess I’ve already started shopping for things for our fall trip. Caedmon has specifically requested a Donald Duck shirt for our upcoming trip. Since Donald is not the easiest character to find, I took advantage of a sale at DisneyStore.com and got a shirt for both kids. They’ll serve double duty as a surprise and a Disney shirt to wear in the parks. Some other things I've had my eye out for are stickers/activity books, coloring books/sketch pad and markers, glow sticks and/or necklaces/bracelets. I was able to score quite a few things at the Target $1 Spot last week, and I’ll watch for clearance sales on t-shirts and other fun items over the next few months. Daily surprises are not something everyone does, and that’s completely fine. I do it because it’s fun for me, it adds to the magic for my kids, and I’m able to use things I’m going to buy anyway and they’ll enjoy using for a long time. What’s your favorite “extra” for Disney trips? 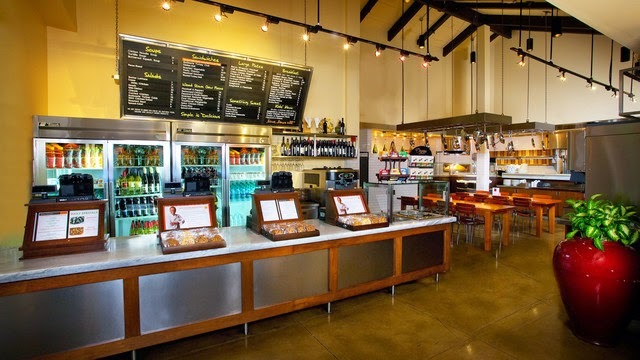 Finding a great quick service restaurant can prove to be a little bit tricky. A lot of them have the same food, but go by different names. That's all fine and well if you are super picky or don't care about diversity in your food choices, but my family likes change! As I made my list of quick service and table service dining options (part of my routine pre-trip preparations) I came across the Wolfgang Express. 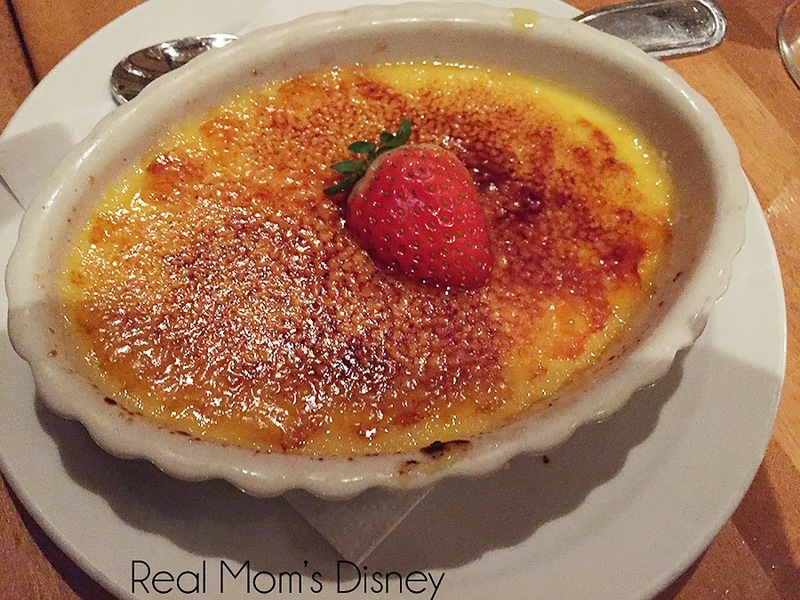 I was investigating dining in Downtown Disney because my family loves spending time there. We didn't even notice this restaurant during our 2013 trip. It's sort of tucked away into a corner, and the entrance isn't very grand. It seems that you really need to be looking for it to find it. During our last trip, we visited Wolfgang Express twice for dinner. Both meals were delicious and by far our favorite quick service dinners. I would even say that it was better than a few of our table service meals (we definitely liked it better than Tusker House). You walk in the door and are instantly in line. You'll work your way up to the counters pictured above and place your orders - the menus are overhead and easy to read even from the back of the line, so try to have your order ready to go (the people behind you will appreciate it)! For my two dinners, I had the Spaghetti with Chicken Meatballs (which was DELICIOUS!) 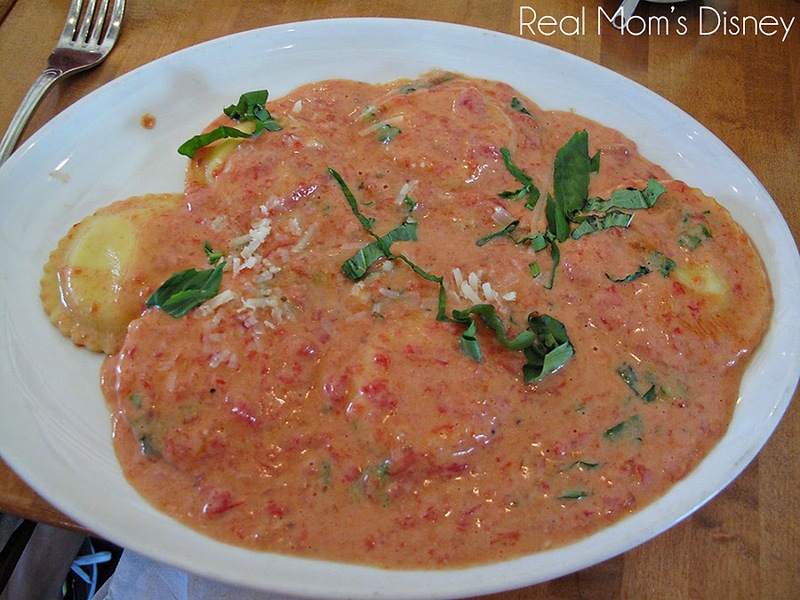 and the Cheese Ravioli. My picture of the meatballs looked awful and I didn't want to do them that injustice. And the salmon. He loved them both! I tasted his pizza and it was really, really good. With our dining plan came dessert. Chris had the creme brulee while the kids and I had cookies. Everything was great! 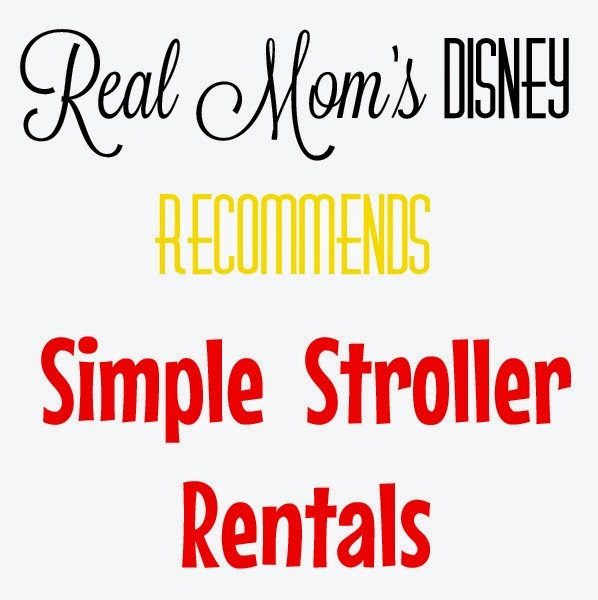 If you're planning on visiting Downtown Disney (and you should! ), then be sure to add Wolfgang Express to your list of eateries. You can view the full menu here. Use the drop down box to select which meal you would like to view. On the fourth day of our trip, we had a wonderful time at Epcot! We started out with Soarin' as our first ride! I took Evy and Liam while Kurt waited with Lynley (more on that in a minute). Liam wasn't so sure at first. This was his first trip where he met the 40" height requirement, so he had many new experiences! He was a bit unsure. . .but quickly changed his mind! He loved it!! Like I said, Kurt watched Lynley while the kids and I rode Soarin'. They have a Rider Swap pass that you can use if one parent is waiting with a little one. But here's the trick: up to 3 people can return with the Rider Swap pass, and it doesn't have to be used right away! The expiration date listed is something like a year from now? So we saved our Rider Swap pass (it looks like the old paper FastPasses) and used it that afternoon when Liam and Lynley had gone back for a nap. So Kurt, Evy and I got to ride Soarin' all together in the afternoon when the lines were long, and it didn't count as one of our FastPasses! Just a fun and useful tip! We normally ride Test Track after Soarin', but it was broken down, so we headed to meet the characters! The kids did great! Lynley ran up to each character and posed perfectly! It was just adorable. Kurt and I didn't have to do anything except tell them to smile! Maybe we're almost to the "character auto-pilot" stage? After our super fun character experience, we headed to meet the whole family for lunch in Italy! 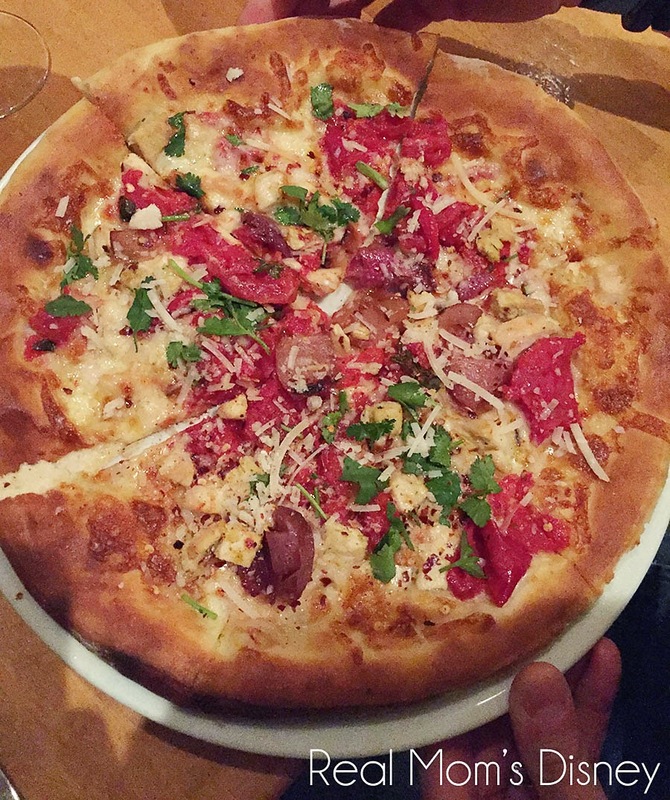 We ate at Via Napoli and it was so good! The pizzas are huge, so it's great to share with a crowd. We ordered 2 large pizzas and 1 medium (or something like that) and shared it among 14 people! After lunch, we headed to my favorite ride at Epcot, Spaceship Earth! I have a strong love for Audio Animatronics and "scenes" or vignettes. I also love the concept of time travel and seeing the progression of how things changed, so this ride is a great love of mine (much like Carousel of Progress in Magic Kingdom!)! After awhile, Kurt's parents took Liam and Lynley back to the hotel for a nap. Evy stayed with me and Kurt to have some quality time, and it was such a sweet time with her! We crossed something off our Disney to-do list: Eating a "Cronut!" (Croissant and donut in one - YUM!). You can find them at the Refreshment Port. Then we listened to the AMAZING Voices of Liberty! DREAM. JOB. We visited all of the pavilions in World Showcase, including my favorite - the UK! Then we did Kurt's favorite thing: buying a treat from the caramel shop in Germany! We enjoyed the American Adventure show, and for the first time, I really paid attention to the statues along the side of the theater. I had never really realized what they represented, but it's so amazing. They each represent a "Spirit" of America, and the Mother represents the "Spirit of Tomorrow." I just thought it was so sweet, with her holding a baby. We're raising and guiding the little people that will make up "tomorrow." We had a fun time on the boat ride in the Mexico Pavilion, and by then it was time for dinner! Kurt's parents brought Liam and Lynley back, and they also brought Evy's costume that she had chosen to bring for dinner. She selected Anna, and she just looked beautiful! We ate at Akershus in Norway for the Princess dinner! I know I'm biased, but I had the cutest little crew there! As we predicted, Lynley went ballistic. I mean ballistic. She's in a Princess phase, so this was her dream come true! I took the kids around in the "parade" with the Princesses around the restaurant, then all in a row, the Princesses arrived at our table! Ariel was SO SWEET. For some reason, Liam took an extra liking to her and he kept hugging her tightly. Ariel (who was clearly touched by it) said, "You're a snuggler, just like Flounder!" For the rest of the trip, Liam would randomly say "I like to snuggle. Like Flounder!" It was a wonderful dinner, and we headed back to the hotel afterward. The kids got light-up toys with their meal, and I would say that Anna and Kristoff felt like royalty that evening! It was the perfect end to a wonderful day! 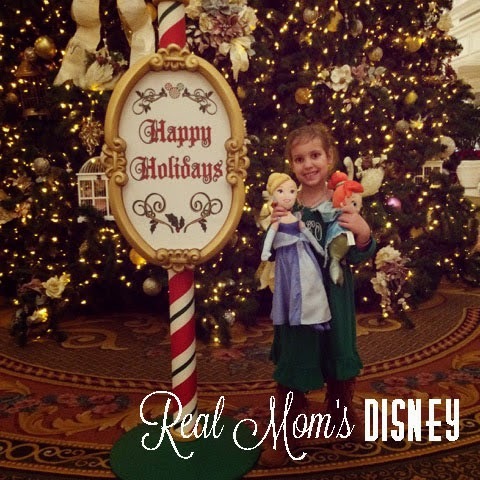 When we planned our December 2014 trip, we originally had picked a dinner at Yak & Yeti on the day we had tickets to go to Mickey’s Very Merry Christmas Party (watch for a post in the next months!). But on the day before our reservation, while we were already at Disney, we just weren't excited to go. So we pulled out our handy-dandy app and decided to see what else was available. Obviously the day before a reservation isn't the best time to try to snag a new one. We knew our options would be very limited. We knew we wanted two things: either near or inside Magic Kingdom since we would be headed there later that night and somewhere that we hadn't been before. Luckily, there was an open reservation at 1900 Park Fare. We had never been there before, nor did we know anyone else who had been. 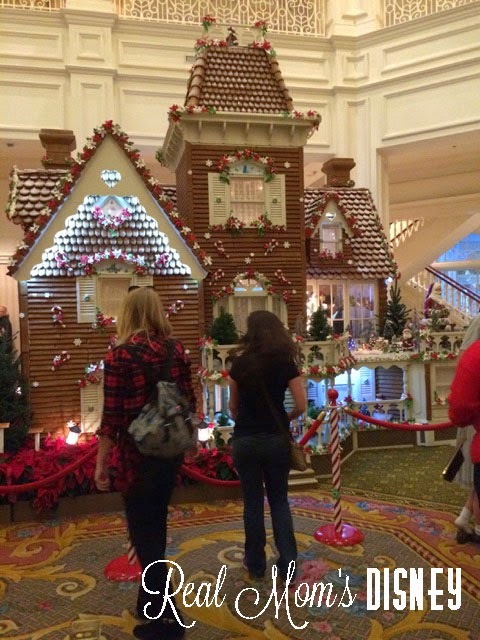 It’s located at the Grand Floridian so we could hop on the monorail to the Christmas Party. We decided to take a chance. 1900 Park Fare is a character buffet. That’s kind of an odd sentence. It’s a buffet in terms of food and the characters come around to your table for picture and autographs. That sounds better. The characters rotate, but on the night we were going it was Prince Charming, Cinderella, Lady Tremaine, Drizella, and Anastasia. You know we love Stepmother and Stepsisters so we were in! We didn’t have to wait long for our table. They’ll also take your picture in front of their mural after you check-in. If you have the Photopass+, or Memory Maker as it’s also known as, this is a great opportunity to use it! While we were waiting, we took some time to look around the resort. 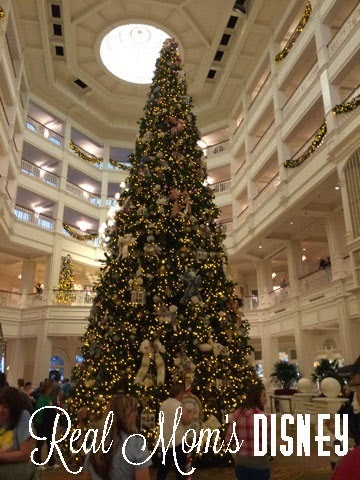 I hope that we have a chance to stay at the Grand Floridian one day. It was spectacular! The food on the buffet was good, nothing spectacular to write home about but good, nonetheless. There were different types of food from different places around the world. Don’t let that scare you. It had a large selection of American food, too. They had a lot of options for kids. Anniston loved the strawberry soup. Not sure what is in it, but she loved it! The characters came around and spent a lot of time with the kids. While this was excellent for the kids, as far as timing went, this was by far the longest character meal we’ve ever had. 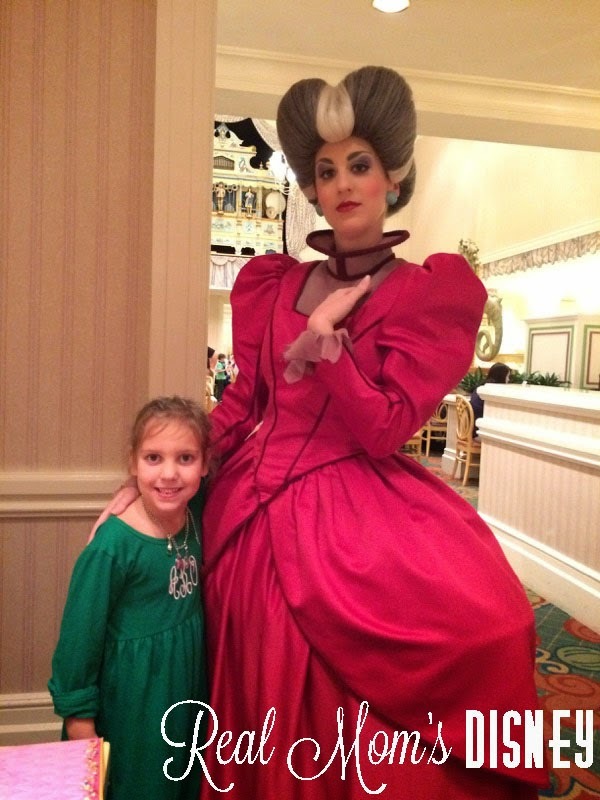 We had been finished eating dinner and dessert and we still had Lady Tremaine and the sisters left. After waiting about 15 minutes, our waitress came to inform us that the sisters had to leave to go to the Christmas Party. We didn’t get to see them there. That was a bummer. All-in-all it was a good experience. We are glad we tried it. 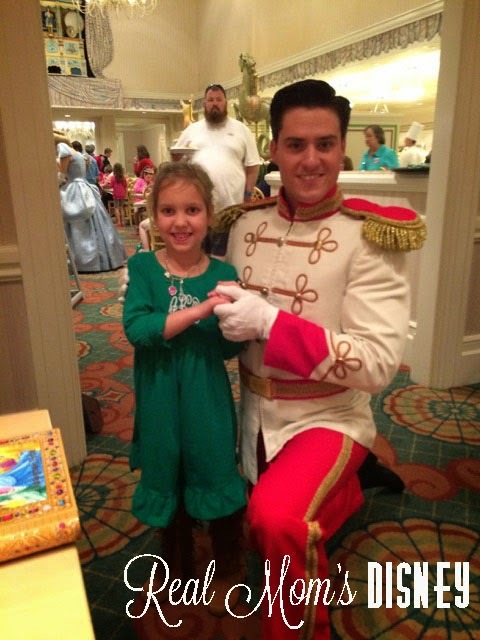 We got to meet Prince Charming! Anniston was dreamy-eyed. I would caution you if you have a tight schedule, you might want to wait on this one. We were there total about an hour and a half to two hours. It definitely threw us off our schedule a bit. Also, if you plan to go there for dinner, they also serve breakfast, check to make sure there isn’t a special event that the characters might have to leave to go to. We were so disappointed we didn’t get to meet the stepsisters. We did wait in line to meet them at Magic Kingdom, but we were really hoping for that character meal meet and greet. 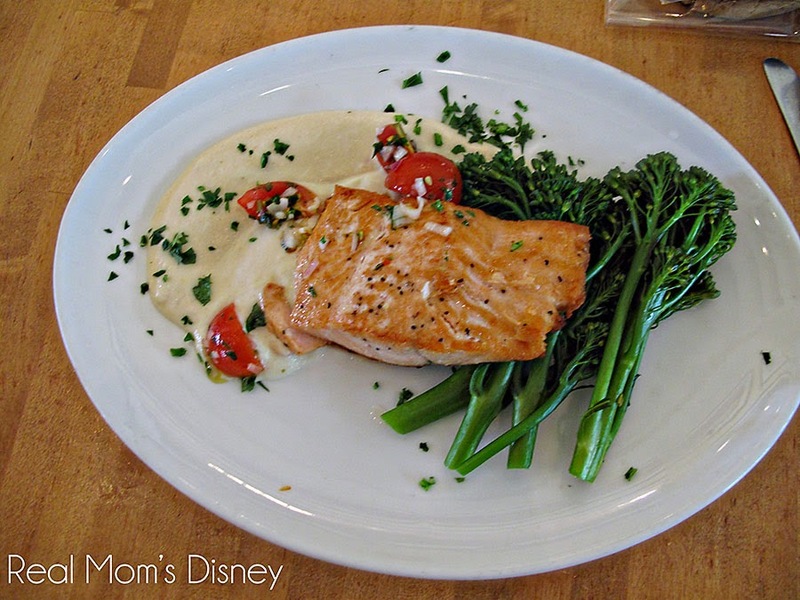 If you are on the Disney Dining Plan, this meal is one table service credit. Here is a link to another review of 1900 Park Fare that contains more information and more pictures. 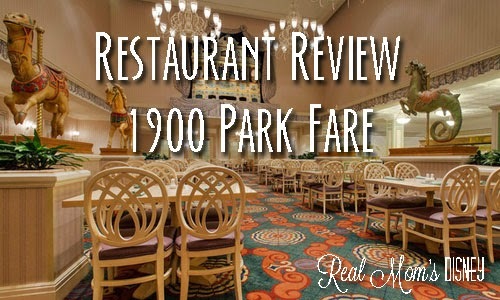 Have you eating at 1900 Park Fare before? What was your experience like?